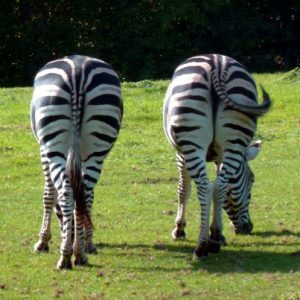 ZEBRA STRIPES? Why do zebras have stripes? Did the stripes evolve for camouflage? “Plains zebra striping pattern varies regionally, from heavy black and white striping over the entire body in some areas to reduced stripe coverage with thinner and lighter stripes in others. We examined how well 29 environmental variables predict the variation in stripe characteristics of plains zebra across their range in Africa. In contrast to recent findings, we found no evidence that striping may have evolved to escape predators or avoid biting flies.” Larison B, et. al. How the zebra got its stripes: a problem with too many solutions. R. Soc. open sci. 2: 140452. http://dx.doi.org/10.1098/rsos.140452, published online 14 January 2015. Even if they had found some correlation between stripes and lions or flies, it is important to keep in mind a basic principle of all scientific and historical studies: correlation is not causation. Just because two things or processes are found together does not mean one explains the origin of the other. Patterns of pigmentation in animals are often claimed to have evolved as part of an evolutionary “arms race” to avoid predators. However, camouflage only works once an animal already has it. Avoiding predators is a useful characteristic, and pigmentation patterns may help some animals survive in the struggle for existence, but it does not explain how that characteristic came about. Here we have a good example of the difference between natural selection and evolution. Natural selection is a real ecological process, and explains why living things with certain characteristics survive in the environments they are found in. Evolution is supposed to be an explanation of how those characteristics came into being. It was Darwin who first confused and falsely equated the selection of an already existing characteristic with the explanation of how the characteristic came about, i.e. its origin. The full title of Darwin’s famous book is On the Origin of Species by Means of Natural Selection, or the Preservation of Favoured Races in the Struggle for Life. Selection and preservation are not the same as origin. Selection merely maintains structures and function that already exist and have proven useful for survival. Darwin was wrong about this in 1859, but in 2015 scientists and news services were still writing articles with titles like “How the zebra got its stripes” (See reference above) with little more scientific value than the old “Just So Stories for Little Children” by Rudyard Kipling. Natural Selection is a real process, but it cannot explain the origin of pigmentation patterns even though may help animals avoid being selected out. To get a pigmentation pattern you need genetic information for making the pigment and laying it down in a pattern. Genetic information requires an intelligent Creator to invent it and place it in the genome of the animal. That leads to another question – do stripes have any function? Do you remember the Asian martial arts movie star and comedian Jackie Chan who brought the house down with his reply to the white Caucasian police who asked to describe the criminal and he replied he couldn’t because all you white men look the same! After all, how do Chinese recognise each other when everyone looks alike? Now if you look closely at herd of black and white striped zebras you will see that the precise size and pattern of stripes is not the same on every animal. Like fingerprints to a detective the variations in stripes makes them much easier to recognise as individuals. Now let’s look at camouflage in the light of Biblical history. In the beginning God created the world very good, and people and all animals were created to eat plants. (Genesis 1:29-31) In that very good world there was plenty of nutritious plant food, and animals were not aggressive. Therefore, there was no need for camouflage because there was no need to hide from any other animals or from people. However colours and embellishments are useful as courtship and social signalling. Therefore many animals had these, including zebras. The pattern of stripes is not exactly the same on every animal, so the stripes can be used for recognition of individuals. Sadly the world did not stay very good. By the time of Noah the world was filled violence and corruption, (Genesis 6:11) so any benefit that colours or shapes had for helping to hide an animal from aggressors would have enabled it to survive and breed. Even if zebra stripes don’t function as camouflage, colours and patterns are useful as camouflage in other animals. After Noah’s flood the environment became worse and God gave permission to eat meat. (Genesis 9:2-3) Animals used whatever resources they had to find food, and to hide from other animals and people that would eat them. As we said before, this only worked because animals already had these features, including colours and embellishments that made them blend into the background more easily. If they didn’t already have them it was too late – they lost in the struggle for survival. The individuals who did have them survived and reproduced and are still here for us to admire and wonder about. Who doesn’t like seeing zebras in a zoo or wildlife park? Were you helped by this answer? If so, consider making a donation so we can keep adding more answers. For USA tax deductible donations click here. For UK tax deductible donations click here. For Australia and rest of world click here. Diane Eager has a background in medicine, and was a lecturer in biomedical sciences at University of Canberra. She now works for Creation Research, writing and doing background research for our publications and DVDs, as well as giving presentations. She is particularly interested in design in living things and how living things interact with one another, as well as developing a Biblical understanding of biology. MAN FROM DUST? My sceptical friends say it is impossible for God to create Adam as a living adult from non-living dust. FISH FOSSILS can form when fish do sink in cold water! Why don’t you admit this? 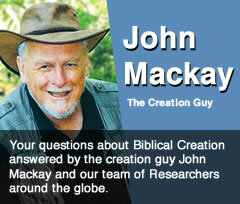 FLOOD FISH: If the rain for Noah’s Flood was fresh water, then how did saltwater fish survive? SNAKE VENOM: If God made everything good, why are snakes venomous? DAIRY COWS suffer pain and inflammation if they are not milked, so did Adam and Eve have to milk cows? GIANT ANIMALS are dangerous by their size alone. Was giantism an effect of the curse? HAIR: Did Jesus have long hair? LIVING IN EDEN: Do we know how long Adam and Eve lived in the Garden of Eden? TIME IN EDEN: The Bible doesn’t say how long Adam & Eve were in the Garden. Does this allow an old earth? NOAH: What Race was Noah? What colour was he? Where in the Bible can I find out? APE-MAN? Man, apes and monkeys: what are the differences? DEATH: Did God really kill animals to clothe Adam and Eve, or did He create new skins for this purpose?